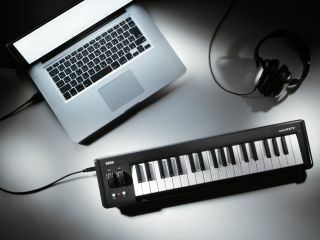 Korg microKey: the playable mini controller keyboard? The microKey and a laptop will be natural bedfellows. Korg has unveiled the microKey, a new ultra-portable 37-note controller keyboard that features the same keybed as you'll find on the company's microKorg XL and microStation instruments. Befitting its tiny size, the microKey comes with mini keys, though we suspect these will be far more playable than those that featured on the nanoKey, the weak link in Korg's otherwise excellent nanoSeries range of controllers. We've always wondered why the company bothered to release a keyboard that didn't have proper keys, but hats off to Korg for (seemingly) getting it right this time. That said, it's also worth noting that Akai has already released a mini-keyed controller - albeit a 25-note one - in the shape of the LPK25. Also included are licenses for Korg's M1 Le, EZdrummer Lite and Lounge Lizard Session, plus a discount coupon for Ableton's Live range. There's no confirmed price yet, but we know that the microKey is scheduled to ship in November 2010.